Planning a vacation this summer, and not sure who to call upon to water the houseplants? Try calling upon the Keeper… Plant Keeper that is! 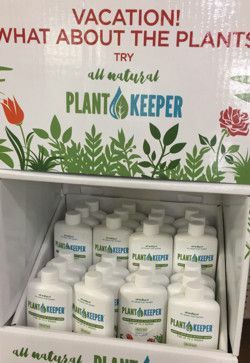 New to our Lawn and Garden Department is this exciting product that keeps plants alive for up to 2 weeks. It is simple to use… simply dilute the concentrate in water to create a gel-like consistency. Then apply to the tops of your houseplants before leaving. The gel will slowly work its way down into the soil and releases water as the soil dries out! The result is a continuously drip of water to the roots of the plant. This process keeps them alive so that you don’t come home to lifeless plants. Use it on houseplants this summer, and continue using it during the holiday season for your live Christmas tree.